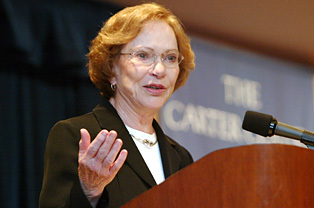 Over the history of the program, Rosalynn Carter fellows have produced more than 1,500 mental health-related stories: eight books in conjunction with the fellowship; five documentary films with two films in the final stages of completion; hundreds of newspaper, magazine, and online pieces; multiple hours of radio and television airtime; and innovative uses of multi-media. Former fellows have been nominated for the Pulitzer Prize and won Emmy and Peabody Awards for their fellowship projects. Topic: Examine treatment options for co-occurring mental health and substance use disorders and how treatment for both differs from receiving treatment plans for just one of these disorders. Topic: Explore the mental health risks that refugees face and how these risks are being addressed in Germany, the United States, and Jordan. Topic: Investigate how state budgets and political ideologies shape access to behavioral health care for underrepresented populations in Louisiana, Wisconsin, and Alaska. Disparities in workers’ compensation and access to care in congressional districts also will be explored. Topic: Determine the level of enforcement of the Mental Health Parity and Addiction Equity Act by sharing stories of those who have trouble accessing care. Topic: Investigate the death of a man that died on the streets of Las Vegas in May of 2013 after living with bipolar disorder and substance use challenges for 15 years. Topic: Analyze the challenges in accessing care for middle-class, insured children with mental illnesses in the United States. Topic: Illustrate the ongoing needs in mental health care and present viable paths to improving care for those with a mental illnesses in Sarasota, Florida. Topic: Research and present the latest evidence on how social stress, isolation, and discrimination affect brain activity, and may be responsible for higher rates of mental illnesses in migrant communities. Topic: Investigate cases of post-traumatic stress disorder (PTSD) among Colombian army veterans and other ex-combatants. Topic: Explore the stigma and mental health issues suffered by thousands of children who are under state-foster-care-protection (at the ICBF) and their work to overcome stigma.